This barley tea’s robust aroma with no color unevenness was achieved by way of a special oven roasting. 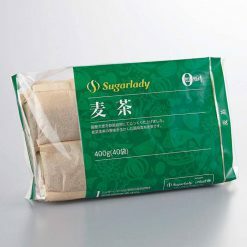 Can be steeped using either hot water or cold water. Barley tea made with the original flavor, taste and the richness of barley. 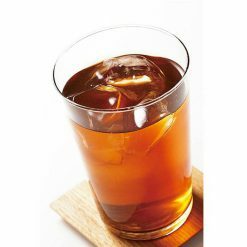 Barley tea (mugicha) is a refreshing beverage you’ll find inside the refridgerator of almost all Japanese households during the summer. Barley has a cooling effect and no caffeine, it is enjoyed by people of all ages during the very humid, hot summer in Japan. Barley tea contains p‐coumaric acid which fights against the oxidization of cells in the body, as well as fights against cancer cells. The tea also prevents the growth of bacteria called S. mutans, which sticks to the sugar left on teeth and inside the mouth. To make hot tea, use one bag per 1 liter of water, but the amount of hot water or steeping time can be adjusted to your liking. When the hot water boils, turn down the heat and put the tea bag into the pot. After about 5 minutes, stir the liquid with a stirrer or chopsticks and take out the tea bag. While boiling, remove or shift to open the kettle lid. Remove from heat and let it cool off before chilling it in the refrigerator. Mugicha can be enjoyed hot as well. Using cold water, employ one bag per 1 liter of water. Put a tea bag in the container first, then pour water over it, then let it chill for about two hours in the refrigerator. Stir the liquid with a stirrer or chopsticks and take out the tea bag after steeping. Adjust the amount of water and time for steeping to your liking. If you are in a hurry, put a tea bag in a heat resistant pot or container, pour about 150ml hot water to soak the tea bag. Let it steep a little darker, add 1 liter of water and chill it in the refrigerator. Adjust the amount of hot water and time for soaking in hot water to your liking. This product contains barley (domestic). Origin of ingredients: barley (domestic). Prepared and packaged in Japan.